31 cm 45 p. : ill. (chiefly col.), col. map, ports. The tragic story of the world's largest and most luxurious liner told in pictures. 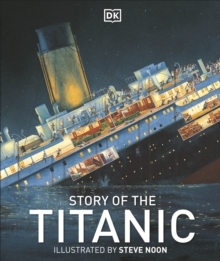 Story of the Titanic presents and disects one of the most tragic events of the 20th Century in a dramatic insight into the Titanic's construction and fit-out, to it's maiden voyage. You'll also hear the tales of the people on board including the captain, members of the crew, and passengers from first, second, and third class. A series of twelve beautiful and unique illustrations with cutaway scenes, by award-winning artist Steve Noon, retell the story of the "unsinkable" liner from the start of its maiden voyage to its disasterous death.